16. Now we need to add a list that we use to connect a workflow with. We create a “List Definition” project item named “Workflow 1 Host List”. We change the “Elements.xml” file of the List Instance project item. We change the Title, URL and Description. 18. Now we start creating a Sequential Workflow. Create a “Sequential Workflow” project item named “Workflow 1”. Create the workflow as “List Workflow”. You will see all the lists we created in the previous steps. Remember: You have to (successfully) deploy the project before you can use the lists that will be created during deployment. – Without previous deployment the wizard may fail before you see the following dialog page. In the first dropdown list choose “Workflow 1 Host List”. All other lists should be selected automatically because there is only one usable list of every needed type. Select all “Workflow start” options: “Manually”, “Item Created”, “Item Updated”. 19. We will add a “Create Task With Content Type” workflow activity that will use our “Workflow 1 Task 1” we created in the steps 1 to 15 (blog post “part 1”). Open the “Toolbox” pane and drag “CreateTaskWithContentType” into the Workflow Designer. Now we need to configure the workflow activity in the “Properties” pane. Set “correlationToken” to “task1” and the sub element of “correlationToken” named “OwnerActivityName” to “Workflow_1”. Now we need to create code behind properties for some activity properties. As example I’ll show how to create a code behind property for “ContentTypeId”. In the dialog select the tab “Bind to a new member”. Enter the name “New member name” and select the “Create Property” radio button. Press “OK”. In “MethodInvoking” type “createTask1Invoke” and press ENTER. – You’ll be directed to the code editor. In the method we initialize the task1-Properties we created before. The “ContentTypeId” is taken from the “Schema.xml” file of our “Workflow 1 Tasks” list where we created the Content Type “Workflow 1 Task 1”. 20. Back in the workflow designer. We drag a “While” activity from the Toolbox pane into the workflow behind the “Create Task” activity. “TaskId” => Bind to the existing member “task1Guid”!!! 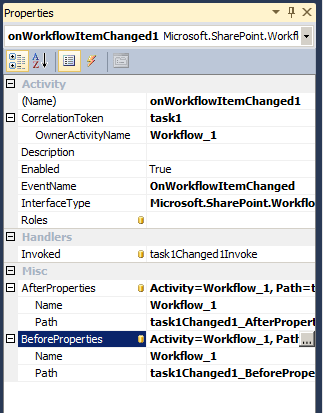 In the “Invoked” property add the method name “task1Changed1Invoke”. – The code editor will be opened. This property we set inside the “OnWorkflowItemChanged” activity. It will contain the information whether the Workflow Task Item we created before was “Completed” by the assigned user. In the “task1Changed1Invoke” method we set the “isFinished” property. 22. Now we need to specify the condition for the “While” activity. In the workflow designer select this activity. In the “Condition” property select “Code Condition” and expand the property. Enter “while1Invoke” in the subproperty with (the same) name “Condition”. The “e.Result” property has to be “TRUE” as long as the while loop should run. It should not run anymore (“e.Result = false”) if “isFinished” is TRUE. Select the “completeTask1” activity and edit it’s properties in the Property pane. 25. Deploy the project. – It deployed successfully ?! – Congratulations! 26. Open the browser and navigate to “http://sharepoint.local/sites/workflow”. Open the “Workflow 1 Host List”. Add a new item… – The “Workflow 1” should start automatically. In the “Tasks” section open the context menu of the element “(no title)”. – We did not set a title for the created “Task 1”. This could be done in the method “createTask1Invoke”. Just edit a property and click “Save As Draft”. On the Workflow Status page you see that the workflow is still running but was modified (“Last run”). Then edit the task again. Click “Complete Task”. 27. We have done it! – Now we could add a “Task 2” for this “Workflow 1” where some other data is requested from users. With that method you will be able to add custom forms for Workflow Tasks. You could also use forms you create with Silverlight !!! Tried this tutorial. Part 1 worked fine, but part 2 gives me the ‘System.InvalidOperationException: The event receiver context for Workflow is invalid’-exception when starting the workflow. All the answers I get from Google is that either the TaskID, CorrelationToken and/or the TaskProperties are incorrect configured. I’ve checked the code and the workflow and can’t find anything wrong with how the TaskID, CorrelationToken and/or the TaskProperties are configured. Any idea would be appreciated. However there are a discrepancy between what you write in step 20 and the corresponding image of the properties of the onTaskChanged1-event. You write that we should use an onTaskChanged-event in the workflow, but in the image it is clearly an onWorkFlowItemChanged-event that are displayed (https://blog.kenaro.com/wp-content/uploads/2011/03/image53.png). Thanks for you comment! – You are right: There is (was) an discrepancy between the screenshot and the text. I’ve corrected the screenshot. – Did you download the complete demo project from codeplex. I tested it now again and it works on my machine. I’ve now downloaded the demo project and that worked fine. A closer look revealed that it actually was something wrong with my correlationtoken-configuration. I configured the correlationtoken for the task as the same correlationtoken for the workflow, so my mistake. Good to hear 😉 – Thanks for your reply ! Successfully Used you guidance thank you very much. One question – how can i get the Custom Field value created in the ASPX and use it in the workflow. I created a Custom Field Called – Revision Date(DateTime Fiels) on the Task form when the date is changed i want to Update the Documeny Library item with the date value selected. You could use the list items property bag. See http://msdn.microsoft.com/en-us/library/microsoft.sharepoint.splistitem.properties.aspx for detailed information. – If you need further assistance please contact me. I successfully used you tutorial thank you very much. The WF initiator fills a form with x approvers (person or group fields). A task is created for approver1, when approver1 approves the document, a task is created for approver2 and so on until the last approver approves his task. (if only one approver does not approve the task, the workflow ends). How could I do the form for the initiator? Maybe using an initiator form from VS2010? If so, how can I put in it person or groups controls? How could I make the approver approves his task? By clicking on complete button? I’ve created a new Walkthrough for “Association Form” and “Initiation Form”. 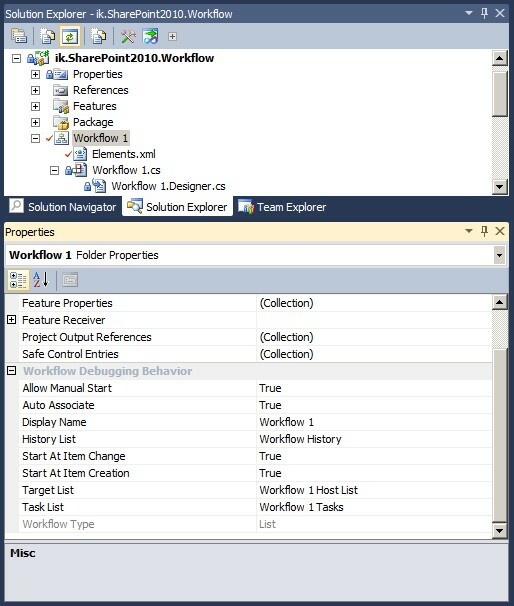 See this article: https://blog.kenaro.com/2011/04/24/walkthrough-create-sharepoint-2010-workflow-association-form-and-initiation-form-in-visual-studio-2010-by-using-application-pages-part-1-of-2/. If you have further questions please post another comment. Who do you check, in Visual Studio 2010 in a Sequential Workflow, if the workflow was started when an item is created or when it has been modified? The reason being is I need to preform different workflow actions depending on if it is created or not? I have tried to IfElse activity but I’m not sure what to check for. Also is it possible to have two different workflows, the first workflow starts on item create, which contains a CreateTask action and the second workflows, which is starts on item modified, which has an UpdateTask which sets properties on the same task which was created in the first workflow. The reason being is I receive an error when I run the second workflow complaining about CorrelationToken. How can I use the same / reference the same CorrelationToken for the two Tasks? Your second question: You can have multiple workflows on a List or Content Type or… All associated workflows will start as configured. If the are more than one the will run parallel and without any notice of the other. (A “connection” between them could be done in code of course.) You cannot connect them by using CorrelationTokens. Normally a workflow task item is connected to a special workflow instance. If you need to do this you have to store the workflow tasks ID at a diffrent place where both workflow instances can access this information. First of all thank you for this aritcle. I Sucessfully implemented this in my project. The attribute ‘autoeventwireup’ is not allowed in this page. just remove the attribute and register the type as “safetype” in visual studio. – did this solve your problem?? Can you please guide me to registerthe type as “safetype” for my custom task form. 1. Copy the Namespace of your Custom Form code behind class to the clipboard. 2. Go into Solution Explorer. 3. Create an “Empty Element” Project item. 5. Select the “Empty Element” project item in the solution explorer. 6. Click “SafeTypes” in the Properties pane. 7. Add a new “SafeType”. Enter the copied namespace in the SafeTypes properties. This solution worked. Thanks for the quick update.This article really awsome. Please check the 14-hive in the file system and search the page in the site structure with SharePoint Designer 2010. – Can you find the page? Can you access them by specifying the page url in the browser directly? I’d think that your module project item is wrong configured! I am able to deploy both the projects, but on adding an item in the “workflow 1 host list” the workflow status remains “Failed on Start (retrying)”. I followed all the steps twice, but I get this error still. I have finished your walk through, and I’m trying to expand on it. Mainly adding different controls (e.g. RadioButtonList, DropDown, CheckBox, etc. ), and how to reference them in the workflow code-behind. But this guide, like all the others, does not let the assigned approver to say, that document (list item, whatever) is not ready (=not good enought). How do you usually work this out? What task status do you use? How do you inform the wf_initiator that some more work should be done? Part 2 was a lot easier than Part 1!! I had to remove the kludge which I added for testing at the end of Part 1 (the line li[SPBuiltInFieldId.WorkflowVersion] = 1; ). Once the content type was connected to the workflow, it prevented the OnTaskChanged item from firing, but the problem with ‘task locked by running workflow’ went away at the same point. Thanks again for your blog. Thanks for the great article. But I have one problem, I want to use an infopath basd form as Template type for the Host List being created. Can you give me some clue on how should I go about acheiving that? I do trust all the ideas you’ve introduced on your post. They’re very convincing and can certainly work. Nonetheless, the posts are very brief for novices. Could you please lengthen them a bit from next time? Thank you for the post. Thanks Karstein for detailed blog post. I completely followed blog post and able to successfully create the workflow, now i am in the process of changing the workflow to approval/reject and added association and initiation pages as well. My question is when the workflow in rejected it need to go back to initiator to re-submit (after making necessary changes) and then it should goto approver again. What is the way/best way to do this, can you provide any sample for this or any ideas. Coluld you share it your Approve code? Reblogged this on My Sharepoint Experiences. your demo is great. however, there is a bug with ‘Workflow 1 Tasks’, if you add a new item in this list by ‘Add new item’, then you modify it. the first time of modifiction is all right, but the second time of modification, you will get error “This task is currently locked by a running workflow and cannot be edited. “. the reason is the currentitem[WorkflowVersion] = 512. then the system think it has been locked. but if you do ‘currentitem[WorkflowVersion] = 1’, then you can update it. but , the item won’t be fired onTaskchanged event. it only happended for those creating by ‘Add new item’. the item created by workflow is working fine. but, i haven’t figure out how to fix it. I had the same problem. Make sure you DONT use the same corelation token as in OnWorkflowInitiated action. I am kinda confused here. Lets say I have to create 2 custom task forms and for that probably i have to create to content types. Another confusion is that tasks which are being created does not reside in the Tasks List, instead it resides in our custom task list. So how we are going to inform user that there has been task assigned to you . And if there are 2 content type, does that mean that i have to create 2 custom task lists for this ? Thanks so much for this tutorial. I downloaded a copy of demo code. I went through it step by step using website’s info. I must say I am so pleased. It runs seamlessly. If anyone is having problems, I would advise them to download a copy of demo code. I now understand how custom task form is implemented. Super. This worked. You are giving very high level steps, but very cleanly and neatly. This enables me to see the workflow under workflow templates. Then I manually added this workflow template to my content type document library, the problem is that when the workflow is run, it creates the workflow task in the default task list and not the custom one that we created. My workflow tasks need to be created on the task list that we created so that I can be able to use the custom form to edit the task. Please help. I used this article to build a similar workflow. but whn i am deploying it, i am getting following error. “Path needs to point to valid member” for all the activities i have created. it gets deployed but it doesn’t create the workflow. can you please help me with this. I just wanted to thank you for taking the time to post this walkthrough. I’ve been hitting the books for many months as time permits trying to figure this out on my own but haven’t made very good progress. This article seems to be the only source out there that explains how to do a workflow with an ASPX task form in Visual Studio. Hi, Is it possible to create the above sequential workflow using VS 2012 SharePoint 2013 workflow (XAML) model. How to achieve it. I’ve been trying to make a workflow for quite some time now and keep running into the same error someone brought up a few years ago…Whenever I try to deploy it gives me the error “Path not valid, path needs to point to valid member”. It deploys, but the workflow doesn’t work (sends an email on item change). The paths are definitely valid, but for some reason it doesn’t recognize them on deploy.